Let’s download the Training demo data and unzip the files in the qgis-server-tutorial-data subdirectory to any directory. We recommend that you simply create a /home/qgis/projects directory and put your files there in order to avoid possible permissions problems. The demo data contains a QGIS project named world.qgs that is already prepared to be served with QGIS Server. If you want to use your own project or you want to learn how a project is prepared see the Configure your project section. Pasting them into Mozilla Firefox works properly but other web browsers like Chrome may add unwanted spaces between the field:parameter pairs. So, if you encounter this issue you can either use Firefox or modify the URLs so that they’re in one line format. In the Apache config from the previous lesson the QGIS_PROJECT_FILE variable sets the default project to /home/qgis/projects/world.qgs. However, in the above request we made use of the map parameter to be explicit and to show it can be used to point at any project. If you delete the map parameter from the above request QGIS Server will output the same response. By pointing any WMS client to the GetCapabilities URL, the client gets in response an XML document with metadata of the Web Map Server’s information, e.g. what layers does it serve, the geographical coverage, in what format, what version of WMS etc. As QGIS is also a WMS/WMTS Client you can create a new WMS server connection with the help of the above GetCapabilities url. See the Lesson: Web Mapping Services or the Selecting WMS/WMTS Servers section on how to do it. QGIS Server serves layers that are defined in the world.qgs project. 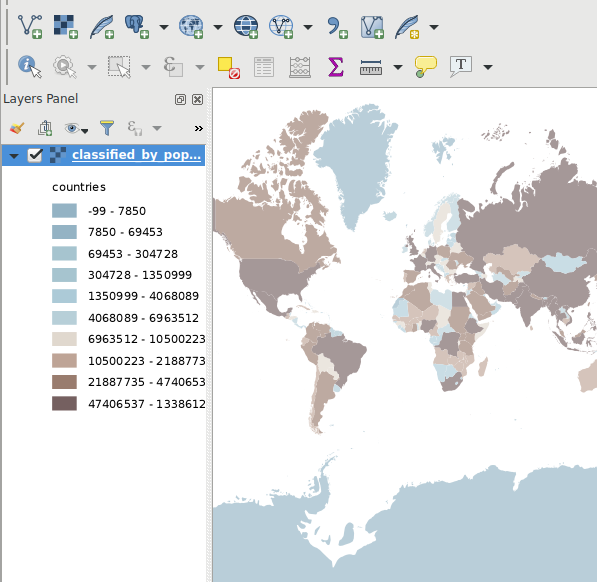 By opening the project with QGIS you can see there are multiple styles for the countries layer. QGIS Server is also aware of this and you can choose the style you want in your request. The classified_by_population style was chosen in the above image. The log files are simply text files so you can use a text editor to check them out. 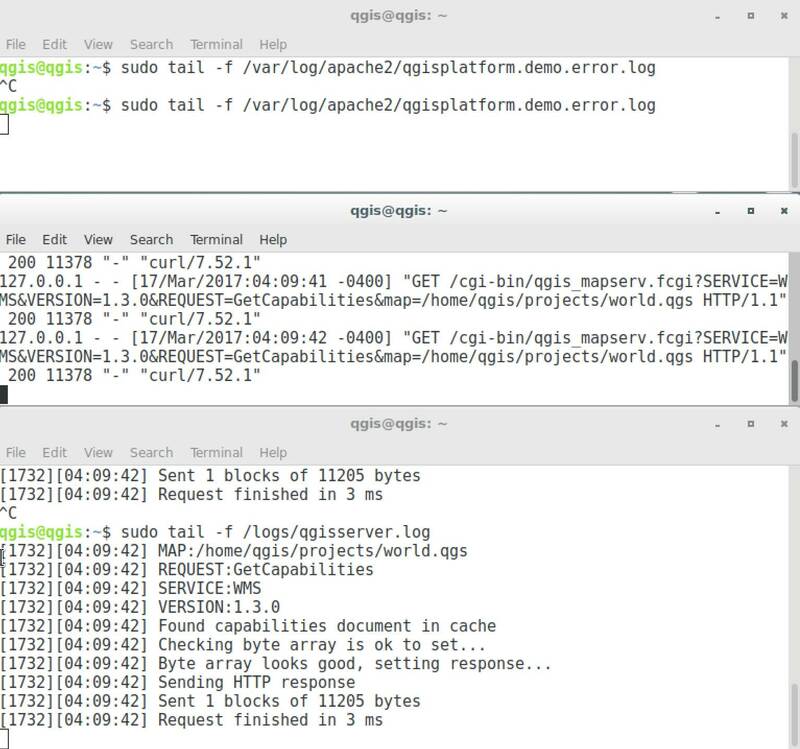 You can also use the tail command in a terminal: sudo tail -f /logs/qgisserver.log. When you use QGIS Desktop to consume the QGIS Server WMS services you will see all the requests QGIS sends to the Server in the access log, the errors of QGIS Server in the QGIS Server log etc. If you look at the logs in the following sections you should get a better understanding on what’s happening. By restarting Apache while looking in the QGIS Server log you can find some extra pointers on how things work. 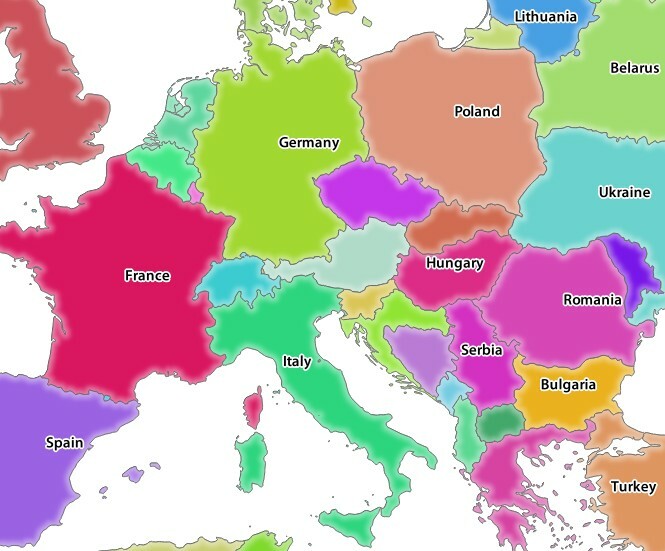 In order to display the countries layer, QGIS Desktop, like any other WMS client, is using GetMap requests. Based on the request above, let’s replace the countries layer with another. In order to see what other layers are available you could open up the world.qgs project in QGIS and look at its contents. Keep in mind though that the WMS clients don’t have access to the QGIS project, they just look at the capabilities document contents. Also, there’s a configuration option so that some of the layers existing in the QGIS project are ignored by QGIS when serving the WMS service. So, you could look at the layer list when you point QGIS Desktop to the GetCapabilities URL or you could try yourself finding other layer names in the GetCapabilities XML response. 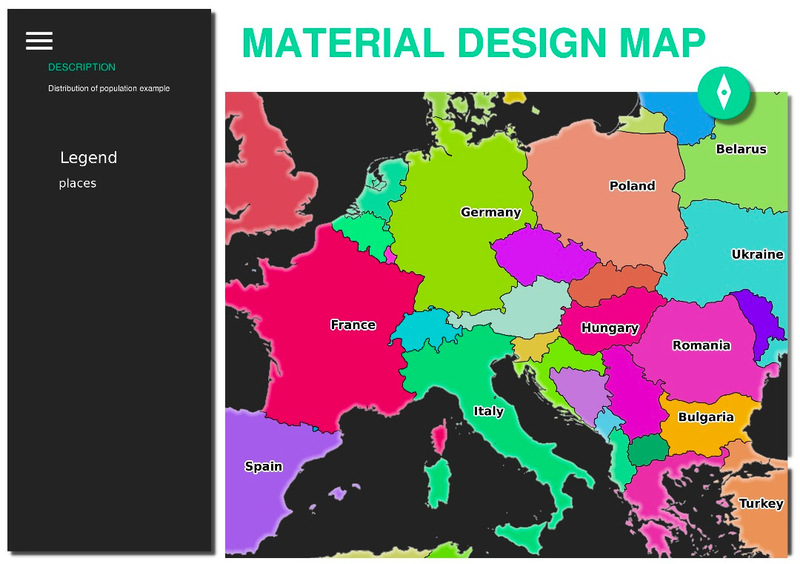 One of the layer names that you could find and works is countries_shapeburst. You may find others but keep in mind some may not be visible at such a small scale so you could get a blank image as response. You can also play around with others parameters from above, like changing the returned image type to image/png. Let’s do another request that adds another layer, some of the Extra parameters supported by all request types, FILTER and OPACITIES, but also uses the standard STYLES parameter. 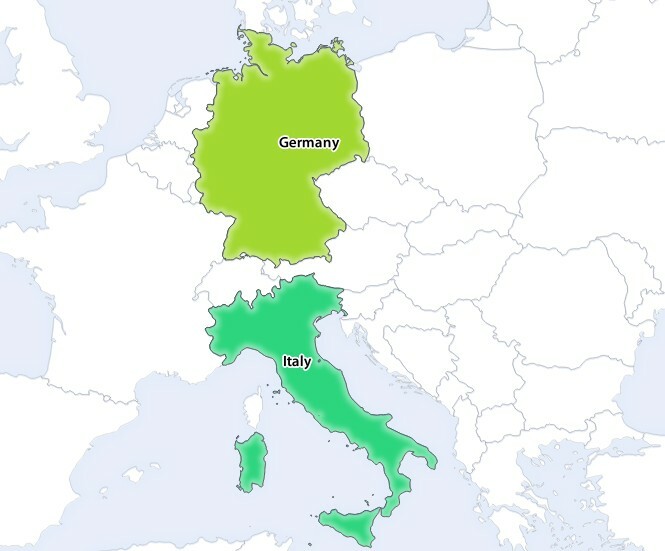 As you can see from the above image, among other things, we told QGIS Server to render only Germany and Italy from the countries layer. 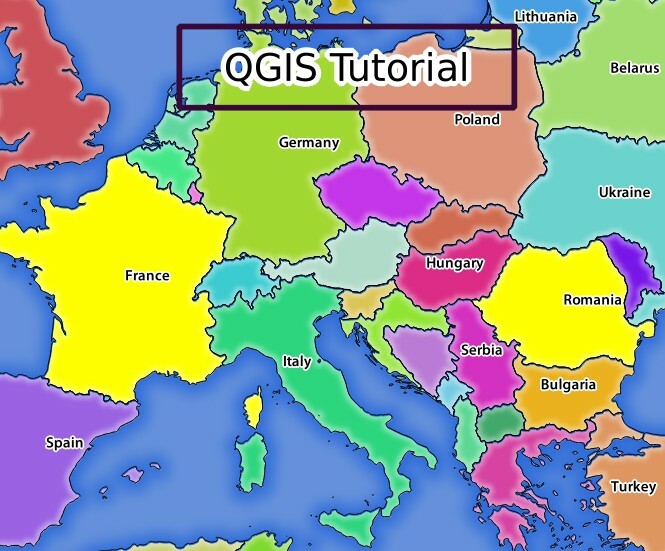 You can see from the above image that the countries with the 171 and 65 ids were highlighted in yellow (Romania and France) by using the SELECTION parameter and we used the REDLINING feature to overlay a rectangle with the QGIS Tutorial label. One very nice feature of QGIS Server is that it makes use of the QGIS Desktop print layouts. You can learn about it in the GetPrint section. Naturally, it’s hard to write your GetMap, GetPrint etc. requests. QGIS Web Client or QWC is a Web client project that can work alongside QGIS Server so that you can publish your projects on the Web or help you create QGIS Server requests for a better understanding about the possibilities. As user qgis go to the home directory with cd /home/qgis. Download the QWC project from here and unzip it. Make a symbolic link to the /var/www/html directory as it’s the DocumentRoot that we’ve setup in the virtual host configuration. If you unzipped the archive under /home/qgis/Downloads/QGIS-Web-Client-master we can do that with sudo ln -s /home/qgis/Downloads/QGIS-Web-Client-master /var/www/html/. Access http://qgisplatform.demo/QGIS-Web-Client-master/site/qgiswebclient.html?map=/home/qgis/projects/world.qgs from your Web browser. If you click the Print button in QWC you can interactively create GetPrint requests. You can also click the ? icon in the QWC to access the available help so that you can better discover the QWC possibilities. You learned how use QGIS Server to provide WMS Services. Next, you’ll see how to use QGIS as a frontend for the famous GRASS GIS.